Say you’re at the park and forgot to pump up your bicycle tires. Or are just riding along and a nut gets loose. Wouldn’t it be great for people on bikes to have the ability to make routine bicycle repairs at select locations in our community? As a supporter of Bike-Walk Dunwoody, you can help this become reality. Any amount you’d care to contribute will get us one step closer. This is a great way for people who love to bike to give back to the community as a show of support, and appreciate the strides we’re making in Dunwoody be a safer & more connected place to simply go for a ride. 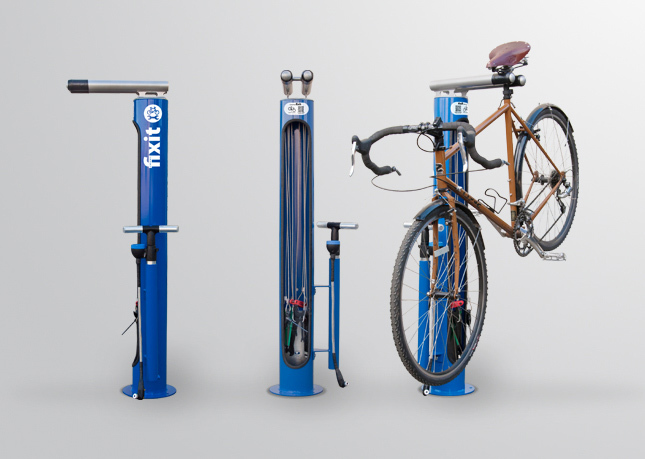 Our friends with the Atlanta Bicycle Coalition led the way last year with a crowdsourcing effort that raised over $8,000 to install several bike repair kiosks at MARTA rail stations. By raising some funds, we too can have a few in our own neighborhoods. 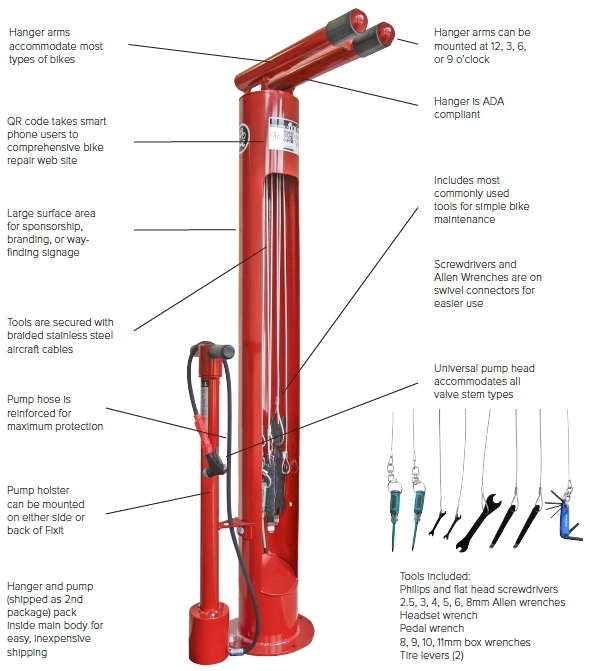 These will be top-of-the-line Dero bicycle repair kiosks made in America which are equipped with the necessary tools for routine bike maintenance and repair, from tightening handlebars to pumping a flat tire. You can find these in Metro Atlanta at selected MARTA stations, in Decatur, Alpharetta and even in Milledgeville – one of Georgia’s newest Bicycle Friendly Communities. It even comes with a QR code to scan so you can get instructions on making simple repairs. Our initial goal is to raise enough funds to purchase & install three bicycle repair kiosks for Dunwoody: Two in our parks and one in the Perimeter Business District. The parks would be in Brook Run near the trailhead across from the skatepark; the other located in the Georgetown area (either the new Pernoshal Park or Georgetown Park). These two would primarily assist trail users. And a third kiosk would be sited in a prominent location in the Perimeter Business District to help commuters. Each station costs about $1,200. A huge thanks to BikeLaw Attorney & Dunwoody resident Bruce Hagen for their generous contribution of $1,200, which pays for an entire repair station! A big thanks to the City of Dunwoody’s Parks & Recreation Department, who has committed to an initial $600 in matching funds! Bike-Walk Dunwoody is partnering with our friends at the Dunwoody Homeowners Association, who’ve graciously kicked off our campaign with a donation of $300. To contribute, please simply use the Donate pushbutton below. When you go to the confirmation page (and get an email), it’ll say Dunwoody Homeowners Association. The funds are going through the DHA and will then be transferred to the city to make the purchase and have them installed. As a contributor, you’ll get a VIP invitation and recognition at the ribbon cutting ceremony. We’ll post our progress here and let everyone know when the first ones will be installed, and also have a ribbon cutting ceremony thanking everyone for their support. During our Bike Walk Dunwoody Fall Picnic & Bike Ride Social, we’ll hold a ribbon cutting ceremony for Dunwoody’s FIRST bike repair station to be installed at Pernoshal Park. For details, please click HERE.